1289. To strengthen the borders of the Kingdom of France, King Philip the Fair decided to have a new castle built. For the time being, Caylus is but a humble village, but soon, workers and craftsmen will be flocking by the cartload, attracted by the great prospects. Around the building site, a city is slowly rising upxThe players embody master builders. By building the King’s castle and developing the city around it, they earn prestige points and gain the King’s favor. When the castle is finished, the player who has earned the most prestige wins the game. A 'gamers game' Caylus, released in 2006, was immediately hailed as a masterpiece of strategy gaming. 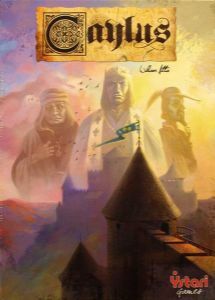 Designed by William Attia, Caylus was winner of the prestigious 2006 International Gamers Awards.